By far a spectacular area of Southern Africa, Kwazulu Natal has an abundance to offer safari visitors. The Elephant Coast, in particular, is where the Hluhluwe Game Reserve – the country’s seconds biggest Big Five Game Reserve – as well as the Isimangaliso Wetland Park which is a World Heritage Site can be found. The moment you arrive in Durban, you’re soaked up by the warm, humid climate but the luxurious lodge facilities at the parks will ensure you’re kept cool and comfortable and there’s always a swimming pool and refreshing cocktail nearby. One of the best ways to spend your first day in South Africa is by spoiling yourself to traditional African spa treatments before relaxing with refreshments and local fare under clear, starry African skies. The Hluhluwe Game Reserve and Isimangalsio Wetland Park offer private accommodation in the form of chalets with glass walls and private outdoor Jacuzzis. Just lounging around the lodge, visitors will see and abundance of bird and wildlife without having to go very far. Visits from the park include trips to the Dumazulu Traditional Zulu Village where visitors can learn about traditional Zulu Tribes, cultures, traditional and be spellbound by the traditional Zulu dancing. Don’t leave Durban without some handwoven items such as traditional table clothes and handmade beaded jewelry. Leisurely extended game drives are on offer where visitors can explore everything from over 500 species of bird life to black rhino, hippo, nyala, crocodile, red duiker, monkeys, waterbuck, lion, cheetah, wildebeest, giraffe, baboons and even wild dogs. A Durban safari is incomplete without an elephant interaction, a truly unique experience right in the heart of Zululand. Visitors can get up close and personal to interact with African elephants and learn more about this species while proffering them a treat or two. To learn more about South Africa’s endangered wild cat species, a visit to the center is a must. Visitors will be mesmerized by the stunning Lynx, playful Serval and agile Cheetah. The animals can be viewed and photographed while partaking in educational tours, viewing feedings and listening to informative talks. Don’t miss out on a visit to the Crocodile and Snake Park, either before indulging in an afternoon game drive to watch the sun set and the predators come out to prey. A visit to St Lucia is also worthwhile. The picturesque village lies within a nature reserve, surrounded by no less than 5 distinct ecosystems as well as the iSimangaliso Wetland Park. There are several top notch restaurants in the village and visitors can take an afternoon boat ride to see crocodiles, birds and hippos. Don’t leave the village without exploring the traditional craft markets as well as the wild beaches. There are safaris on offer to spot rhino, kudu, waterbuck and a multitude of other wildlife. This is just a taste of what safaris in Durban, Kwazulu Natal have to offer. The beautiful coastal city has an abundance of offerings for all preferences along with fascinating history and culture and a world-class aquarium, uShaka Marine World. When the safari is over, be sure to check out the south coast complete with pristine private beaches and world class accommodation. 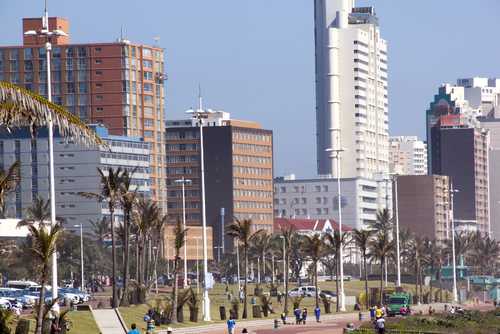 Durban gets particularly during the winter months of June to October when the temperatures are mild, warm and dry. To find out more about Durban safari tours, get in touch with us today.